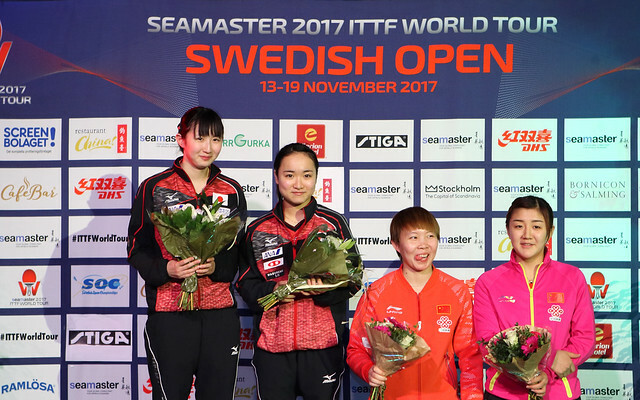 Sunday 19th November marks the closing day of the Seamaster 2017 ITTF World Tour Swedish Open in Stockholm and with four title matches to be decided there is bound to be plenty of drama. Here's a quick look at the running order for day four's action. The first trophy up for grabs on the concluding day of play will be awarded in the Women’s Doubles competition in what could prove to be a highly entertaining match between two very exciting pairings. Hina Hayata and Mima Ito have been faultless as a partnership leading up to the final, but the young Japanese team will be presented with an enormous task to overcome on day four of the tournament as they take on the formidable Chinese duo of Chen Meng and Zhu Yuling. Next up comes the Men’s Doubles final as Hong Kong faces China for the title. Demonstrating great understanding as a team Ho Kwan Kit and Wong Chun Ting head into the concluding day’s action having dropped just the one game across three main draw encounters and will look to end the campaign on a positive note when they meet Xu Xin and Fan Zhendong, who narrowly avoided an early exit to the host nation’s Kristian Karlsson and Mattias Karlsson in the quarter-finals. Following the conclusion of the two doubles gold medal matches come the two singles finals where success for China is assured. Ding Ning has collected many of the top trophies that the sport has to offer with victories at World Championship, World Cup and Olympic level but is yet to lift the Women’s Singles trophy at the Swedish Open, a record she will aim to correct on day four of the main event in Stockholm. Opposing Ding Ning in the final is fellow compatriot Chen Xingtong, who heads into the match with confidence on her side following back-to-back wins against Chen Meng and Zhu Yuling. Regardless of the outcome a new Swedish Open Women’s Singles champion will be crowned. Closing out proceedings in Stockholm is a mouth-watering tie between Fan Zhendong and Xu Xin as the top two seeded player competing in the Men’s Singles event meet face-to-face for the top step of the podium. The two battled it out for the Swedish Open title in 2015 with Fan Zhendong emerging victorious on that occasion, but Xu Xin is not to be underestimated and most certainly has the potential to achieve the reverse outcome in the finale of the 2017 edition of the tournament.